SAN FRANCISCO, CA – In the morning of December 31st, 2017, twelve hours before THE TIMES SQUARE BALL in New York City descends 141 feet from the roof, of the #1 building in 60 seconds at midnight to announce the New Year, the coming of 2018 was announced in the Sansung Hall inside the Asian Museum in San Francisco with the sound of a bell ringing l08 times, SILVIA CHANG, the program’s organizer and Museum Educator for Public Programs, tells CULTURAL WORLD BILINGUAL that the “ JOYA NO KANE Bell-ringing ceremony” is the biggest and most important Buddhist ceremony in Japan, where people travel to the Buddhist temples throughout the country to hear their bells ring. Each bell rings l08 times, One ring per bonno the wordly desires or anxieties that according to Buddhist belief torment humankind. 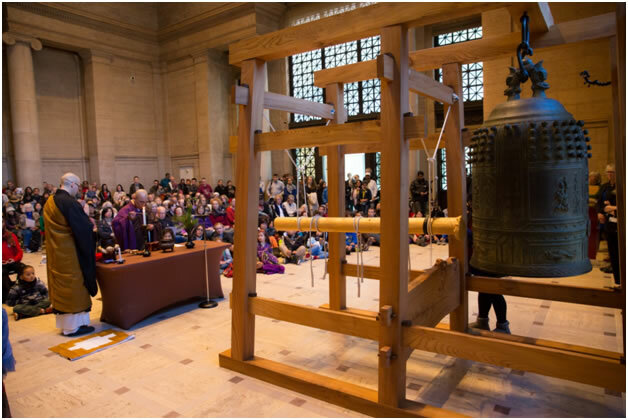 In Japan, the ringing of the bells starts in the old year and finishes right as the clock strikes midnight..
Ms. CHANG adds “the sound of the bell is enchanting,” she says “and it is meant to focus you on being in the moment. Many people come just to listen to the bell being rung for many hours. We are fortunate to have a 2,l00 pound l8th Century bell in our collection that we also allow the public to ring. 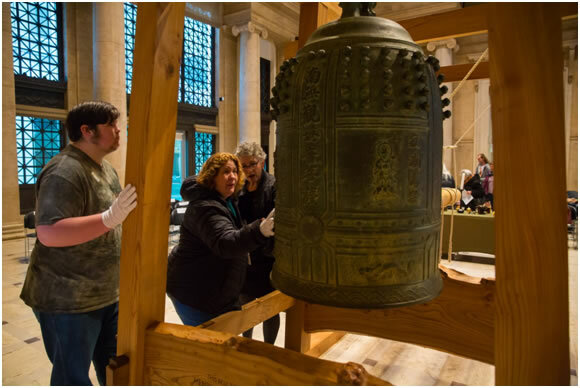 The inscriptions on the museum’s bell include Buddhist texts and information about the bell’s creation such as the artist’s name, date and temple name. These larger inscriptions appear in raised text on the front and back of the bell in a single vertical line. They seem to rise up out of lotus blossoms. The text: Praise Amitabha Buddha Praise Avalokiteshvara Bodhisattva is carved into the bronze on the right side of the bell. This verse is chanted after reading a sutra aloud. 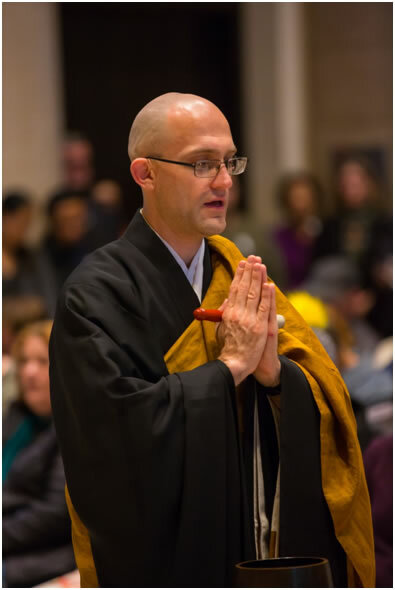 Reading the sutra creates merit, and saying the invocation passes the merit on to other beings who are suffering so that they can attain liberation. We vow to confer our merit on all beings equally May one and all attain awakened mind, be born in the land of bliss. This y Rev. 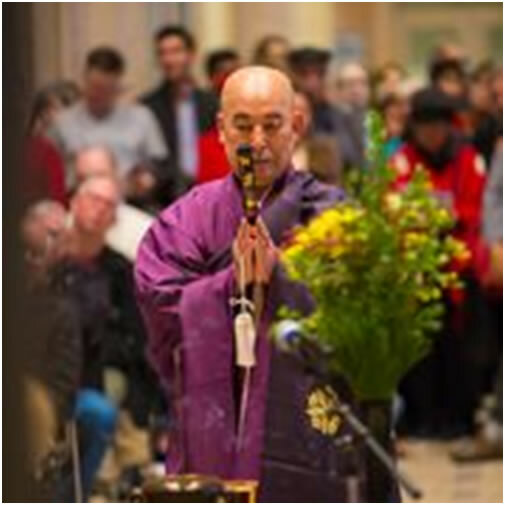 GENGO AKIVA will begin the bell ringing and participants may then take turns ringing the bell to leave behind any unfortunate experiences, regrettable deeds or ill luck from the previous year. In that, the S.F. ceremony is different than the ceremony in Japan. While waiting for their turn, people could make a wish, add a crane to to the museums 1,000 origami cranes or paint a netsuke (charm) for the year of the DOG. The ceremony include a purification ritual and the chanting of the Buddhist Heart Sutra. At the heart of HOYA NO KANE the ceremony is “The Heart Sutra” known in Buddhism as the The Perfection of wisdom Sutra. It is chanted by the Buddhist Monks. In Buddhism, Sutras are conical scriptures, many of them regarded as records of the oral teachings of Gautama Buddha.. The sutra that all phenomena bear the mark of emptiness, was an insight that the noble Avalokitateshvara Bodhisattva, received by the Buddha, when she was practicing the deep practice of Prajnaparamitra, the central concept in Mahayana Buddhism associated with the doctrine of emptiness (Shunyate) or lack of essence (Svabhava). and looking upon the Five Skandhas (previously discussed) Its practice and understanding are indispensable to the Bodhisattva path of perception, mental formation and consciousness. In the Sutra, all dharmas are defined by emptiness because they had not birth or destruction, purity or defilement, completeness or deficiency. They had no form, no sensation, no perception, no memory and no consciousness. No eye, ear, nose, tongue body and no mind. No shape, no sound, no smell, no taste, no feeling and no thought. no element of perception, from eye to conceptual consciousness; No causal link, from ignorance to old age and death. No suffering, no source, no relief, no path; No knowledge, no attainment. Becoming aware of this, it is advised that Buddhists take refuge in Prajnaparamita and live without walls of the mind. That (only) without walls of the mind they will be without fears, and be able to see through delusions and finally reach nirvana. The ceremony ends with the ringing of the bell.